It is easy to activate the device search under Windows 10 and deactivate it if necessary! The solution, ergo instruction is written for Windows 10, to turn off the device search and re-enable when needed, it really makes very sense to use this device search option, whether on the new Windows 10 desktop, tablet, or Surface Pro / Go, or MS 2016 server operating system. PS: If it concerns the device manager: ► Driver update via the device manager ! 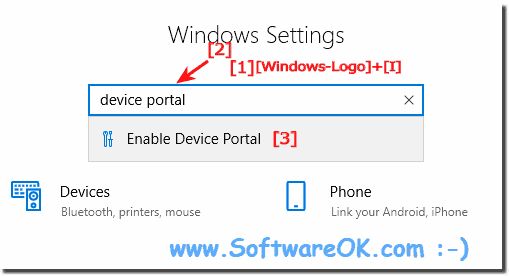 The devices search / portal options in Win 10! In Windows 10, please open the device search option, press the Windows logo + I button combo and enter the text "Device P" then click on Enable device Portal! And customize the device search option according to your needs! PS: However, this is only available in Windows 10 developer mode! (Image-1) Enable and disable the device search! 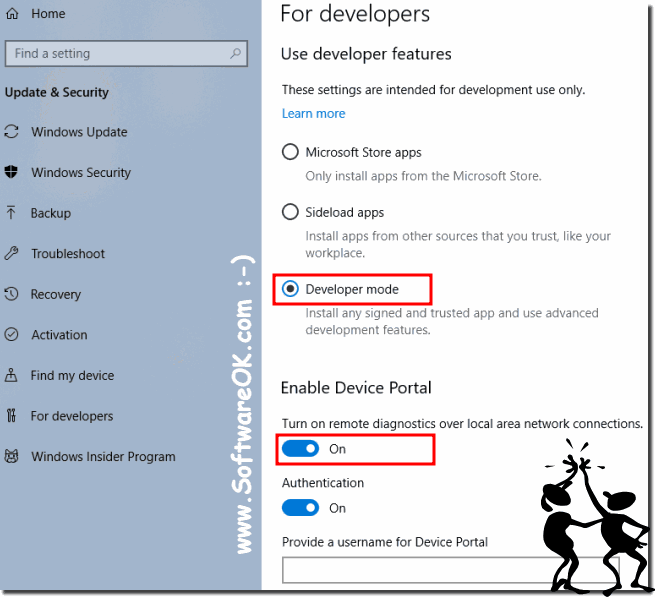 (Image-2) Enable and disable the device Portal in Developer Mode! This screenshot has been made, snipped, created under Windows 10 Professional, However it is easy to enable and disable the device search , you can use this solution without hesitation also use for other versions of Microsoft's Windows 10 operating systems whether it's a Windows desktop, tablet, Surface Pro / Go, or even a server operating system, it has been tested on all and successfully verified. Activating and deactivating the device search, as you can see at the top of the screen shot under Windows 10, is no challenge. You can easily use this simple and fast device search solution on other versions of Microsoft's Windows 10 operating systems, whether it's a plain Windows desktop computer or whether it's device search on mobile devices Tablet-PC, Surface Pro / Go, or even activate it on a server operating system. What can I do if I still have problems with device search is a frequently asked question Restart the Windows operating system, please perform a proper Windows restart here. Thereafter, the problem with the device search should no longer exist. Windows-10 - FAQ-239: Under Windows 10, enable and disable the device search, but how to? Windows 10 installation depends: Do you relax back?